Ah, brunch: It’s that magical time when you can eat and drink whatever you please, as slowly as you’d like, with the best people you know. With this flexible mealtime growing in popularity, Disney is taking notice. Several new brunch offerings have popped up around the Walt Disney World property, giving the hungriest of Disney Fanatics a chance to finally indulge at all times of day. 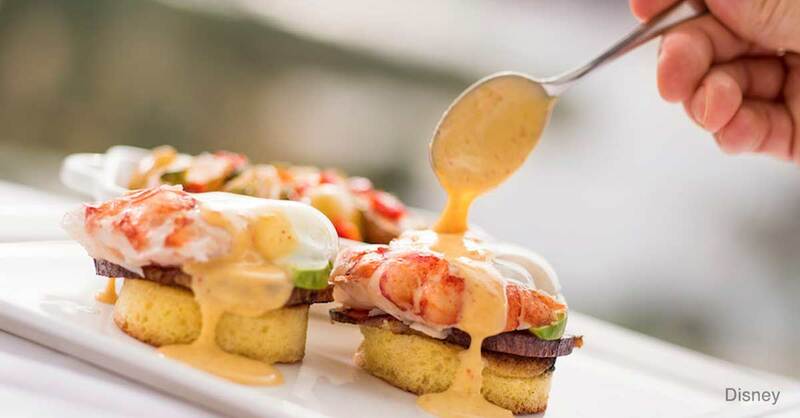 Possibly the most buzzed-about brunching destination of them all is California Grill’s Brunch at the Top. With no shortage of selection, service, or views, this feast will cost you handsomely. However, the right budgeting and timing might make it all worth your while. Here’s a list of eight reasons why California Grill’s Brunch at the Top may be totally worth it. If you arrive early for your brunch experience, there’s a good chance you’ll be seated immediately, assuming space is available. If not, have no fear: You’ll simply redirect to the lounge area of California Grill. Centrally located in the restaurant, the lounge allows guests to live in the middle of the action. Less of a waiting area and more of a jazz club, the lounge is the perfect spot to take in the modern decor, a pre-brunch beverage, and some relaxing live music. Smooth tunes waft through the entire space, enhancing the mood. Preview the sweeping views and enjoy the downtime! Since brunch at California Grill is an indulgent experience, there are quite a few inclusions. As soon as your feet are off the elevator platform, a server will be happy to offer you a breakfast libation. Whether you treat yourself to a mimosa or some french press coffee, there’s no obligation to stop at one serving. A Bloody Mary bar is also located front and center for your enjoyment. Your server will obligingly keep your beverages full, so come thirsty! Have you ever looked down on the Grand Floridian? No, I mean literally *looked down* on it? Before you even have the chance to place a single bite of food in your mouth, you’ll catch sight of what is arguably Disney World’s greatest vista. Peering down from the 15th-story windows and balconies may give you a sense of Walt’s own inner vision. You’ll spy Spaceship Earth in the distance and several of Walt Disney World’s most beautiful resorts closer by. Boats chug across Seven Seas Lagoon and busses race excited visitors to Magic Kingdom. This bird’s eye view will very likely inspire your plans for the remainder of the day. It’s clear from the way that California Grill’s staff fawns over their guests: There is no rushing. Savor your pre-breakfast pastries casually. Revisit the buffet as much as you’d like. Wander off to the rooftop deck and take in the view for a few minutes. Take your time in constructing the perfect Bloody Mary. Consume your desserts with great purpose (yes, dessert comes in droves as well). Brunch is an experience to be had, not a meal to be scarfed. Staying for at least a couple hours is in no way strange. Another amazing bonus included in the price of your brunch will come later in the day. Return to the check-in desk with your brunch receipt in the evening, and you’ll be granted re-entry to California Grill. The elevators will whisk you up to Disney’s best views of Wishes Nighttime Spectacular! Music and lighting in the restaurant are altered to sync with the fireworks just as they would inside the Magic Kingdom, ensuring an enchanted experience. Be sure to arrive early, so you can find a great spot in the lounge or on the observation deck. The team at California Grill will bend over backwards to guarantee you lasting memories. Not only will they keep your tummy full, but they’ll gladly take photos of your party, share tips and a little Disney know-how, and guide you through a seemingly endless array of choices. In imitation of their endless courtesy, we recommend that you return the favor by tipping well, smiling often, and using your most prince/princess-like manners. As of April 2016, cost for this experience is $80/adult, $48/child. The cost does not include gratuity or tax. It is polite to bring a cash tip for valet services. Planning your brunch for a day when you can come back for fireworks is also ideal. Additional mixed cocktails, wine, and beer are not included, but can be purchased. It is wise to review California Grill’s dress code before arrival. With a little bit of preparation and a whole lot of appetite, you’ll find that Brunch at the Top is more than a sumptuous meal with an exceptional view. It’s a memorable experience that will fill your day with plenty of Disney magic, from sunup to sundown. BONUS TIP: Consider planning and booking your next Disney trip with an Authorized Disney Vacation Planner you can trust like MickeyTravels. They’ll help you get the best Walt Disney World deal, share expert advice and their services are totally FREE! It’s genius!